Forwards F12 to ReferenceSource.Microsoft.com instead of showing metadata. Now with Visual Studio 2017 support! Microsoft recently launched a browsable version of the .Net reference source code at https://referencesource.microsoft.com/. This extension lets you press F12 to open the source code for anything in the .Net framework. You can easily jump to the actual source for things linq LINQ or WinForms or ASP.Net and see how they're implemented, including original comments. Just place the cursor on any class, function, or constant in the .Net framework and press F12 to open your default browser. No more "From Metadata" tabs! For source code or bug reports, see GitHub.com/SLaks/Ref12. You can now jump to reference source from VB.Net source files too. When installing on VS2010, you will also need to install .Net 4.5, if you don't have it already. You can now also use the original Go To Definition command to jump to metadata even with Ref12 installed. Either right-click, then click Go To Definition - Native, or assign it a keyboard shortcut by searching the dialog for native and editing EditorContextMenus.CodeWindow.GoToDefinitionNative. If you install the Roslyn End-User Preview, Ref12 will still work fine in the new Roslyn-powered editors. In fact, it will work more reliably (especially for VB); Roslyn is much better at reporting the symbol under the cursor than the native APIs. If you're writing code that uses Roslyn (whether your simply using the syntax / semantic tree APIs or whether you're writing a Roslyn-based VS extension like a diagnostic or a quick fix), you can also press F12 to jump to the Roslyn source code. 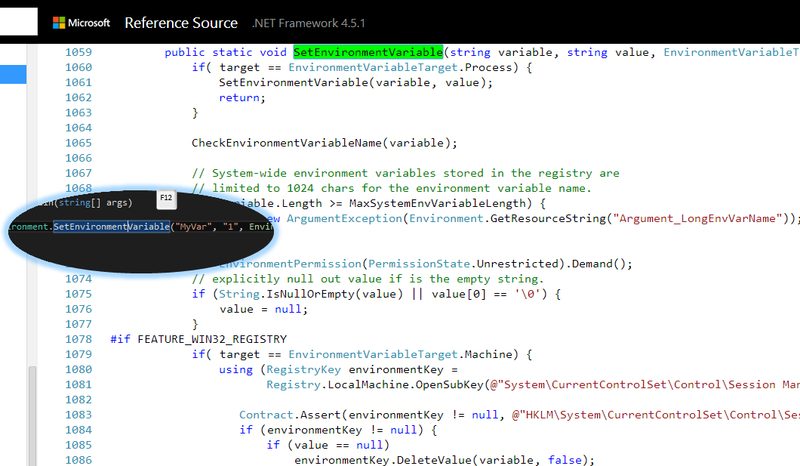 This will work regardless of whether you're using the native VS editor or the Roslyn End-User Preview editor.